Happy Labour Day! 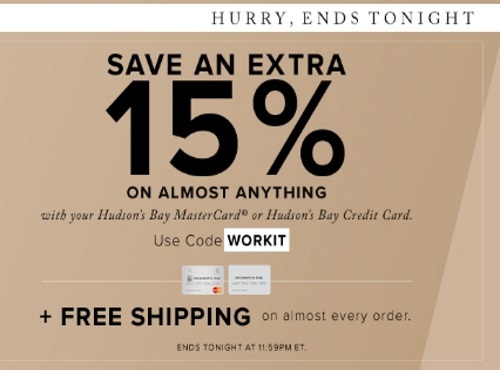 Hudson's Bay is offering an extra 15% off on almost anything when you pay using your Hudson's Bay Mastercard or Hudson's Bay Credit Card! Also, get Free Shipping on almost every order (regardless of method of payment). Enter the promo code WORKIT at checkout. Offer is valid until tonight, Monday, September 5 a 11:59pm ET.